Broken Sword II: The Smoking Mirror is the second game in the Broken Sword series. It was released a year after the first. The game opens with George having to save a kidnapped Nicole. The two dig deeper into what she was investigating, and discover a conspiracy surrounding the impending solar eclipse. It was originally released on October 31, 1997. A remastered version was released in 2010 with high definition art and new character close up art for iPod Touch, iPhone, and iPad. The remastered version was released for PC and Mac in 2011. The original PC, Mac, and PlayStation versions of Broken Sword II are now supported by ScummVM, a program designed to let 2D adventure games run on multiple platforms. 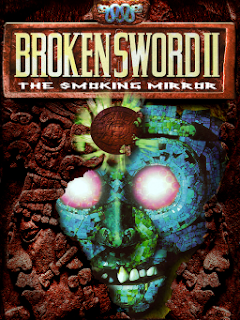 With ScummVM, Broken Sword II now runs on modern versions of windows, as well as Linux, Mac OS X, and many consoles such as Dreamcast, Wii, PlayStation 2, and PlayStation Portable. For a complete list of platforms supported by ScummVM, see here.